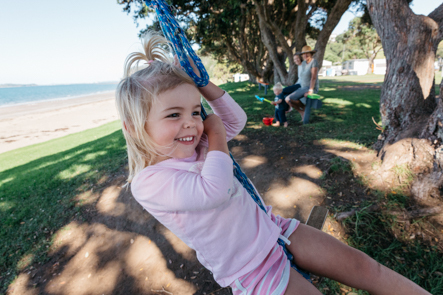 Be in to WIN a family camping experience at Martins Bay Holiday Park! Win a family camping experience for up to 6 people on a regular site for two nights, including kayak hire, at Martins Bay Holiday Park! Prize in the form of a Gift Voucher sent to one lucky winner, to be redeemed within 6 months of issue. One winner drawn at 12pm 21st February 2018. View our T&Cs here. * Prize non-refundable. Cancellations must give 14 days notice. Please note no pets allowed at Martins Bay Holiday Park. Prize not valid during public holiday weekends or between 24 Dec 2019 to 9 Feb 2020. The perfect beach holiday for family fun and relaxation. Located on the edge of the ocean, with Kawau Island and the sparkling Hauraki Gulf at your doorstep, this picturesque holiday spot is nestled into a safe sandy swimming bay only an hour from Auckland. Plenty to keep you occupied here, including kayak hire, fishing, bush walking, children’s play areas and a safe swimming beach with floating pontoon. Join in some of the holiday activities run by the park or just dig your toes in the sand and relax. An all-tide boat ramp and fully secure boat parking area is available.